See You Next Year in Cape Town! All good times eventually come to an end, and the 50th anniversary Plenary held in Montevideo, Uruguay, is no exception. After three full days of insightful presentations, interactive panels of experts, meetings, face-to-face discussions, high profile invited guests, gracious hosts, and exhibitors, ICPC members will be heading home, all over our planet, equipped with new insights and knowledge to better protect seabeds all over the world. Yesterday evening, the ICPC membership was treated to a fabulous night of dancing, singing, and dining that celebrated the finer things in Uruguay. The entire membership thanks our gracious hosts, Telxius and Antel, for this wonderful evening of merriment allowing everyone to unwind and recharge for the final day of the Plenary. Camille Morel (Lyon 3 University, France) highlighted the ambivalence of states in protecting cables outside their national jurisdiction. The discussion also touched on the role navies could play if they were able to take more responsibility for international waters. Richard Norris (Ciena) provided an interesting overview of Software-Defined Networks (SDN) and how this unstoppable technology juggernaut can and will benefit the submarine networking community. Attendees were shown how “intelligent” software applications can provide critical scientific data for analysis, and how to rapidly correlate submarine cable faults with vessel activity – in short, software is in our future. Continuing the theme of arctic submarine cables discussed this week, Zachary Casey (R.T. Casey LLC) gave a detailed presentation on the unique aspects of landing cables in the arctic regions. The key message was that special focus is required at landings, as they’ve the potential to seriously disrupt cable deployment projects. The HVDC panel session (Joska Ferencz, Tom Schmitz, Gary Waterworth, Steve Holden) explained the various aspects of planning and deploying power cables, including the potential impacts on the environment. Someone’s damaged your submarine cable . . . now what? Zoe Scanlon (Office of International Law, Attorney-General's Department, Australia) talked about the legal aspects of cable damage compensation. Unfortunately, the current legal framework is considered rather ineffective with insufficient legal mechanisms for cable owners to seek compensation. Flag state jurisdiction was proposed as a potential method to strengthening controls along with domestic criminal law changes. Seems there’s still more work to do in this area. Tom Manning (S.B. Submarine Systems) reviewed the design and deployment considerations of guard wires for cable protection. SBSS provides maintenance covering the Yokohama Zone where there are ~ 30 faults/year. Stow net fishing is potentially responsible for many of the faults due to large anchors dragged by tidal flows. Parallel guard wires laid alongside the cables in high risk areas to snag the anchor before it can damage the cable was explained. Andy Palmer Felgate, Nick Harland and Gavin Rea formed the Power of the Cloud panel to discuss how content is driving submarine capacity. After a lively discussion, the conclusion was quite clear – submarine cables, and the terrestrial networks they interconnect, are critical to the operation and future success of their businesses. The 2018 plenary location was also announced and it is one of the top cities on earth to visit – Cape Town, South Africa. Graham Evans, ICPC Chairman, “welcomes all members to converge in Cape Town to celebrate 60 years of securely sharing the seabed with others by sharing information and collaborating on multiple initiatives”. The plenary will take place from 10-12 April, 2018. In the spirit of the host country for our 50th ICPC plenary – ¡Adiós! 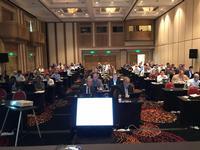 Day two of the 50th ICPC plenary was filled with information, discussions, and debates! Gustavo Coll showed off his impressive collection of submarine cable segments allowing the membership to walk through 160 years of submarine cable development—it was quite the attraction at the Plenary. His table of samples was full of visiting attendees during all breaks with many smiles all around, as people appreciated holding the foundation of our submarine cable industry in their hands. 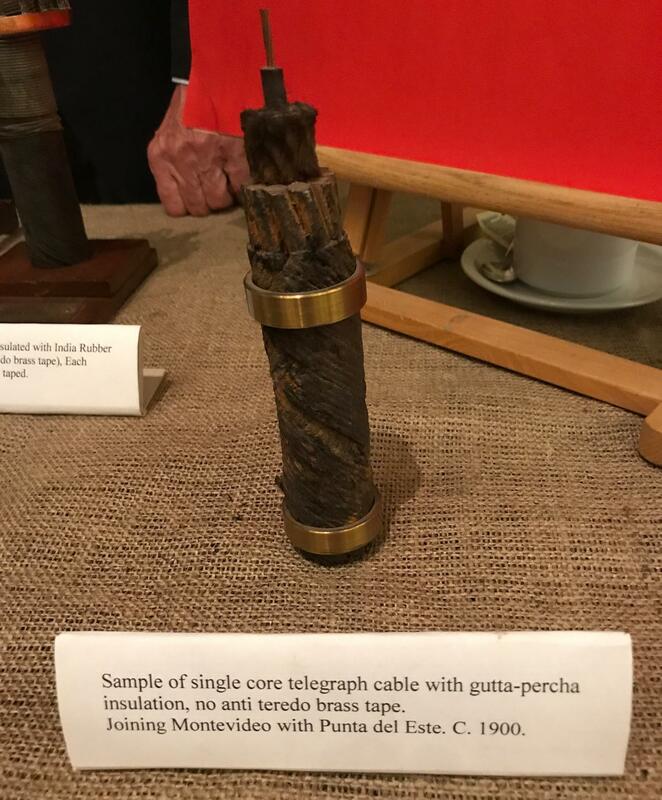 If you’d like to (virtually) check out Gustavo’s collection, which includes items besides submarine cable segments, visit here. My, how far we’ve come in the past 160 years. Kristina Gjerde (International Union for Conservation of Nature) presented how ongoing climate change is changing deep seabed marine ecosystems. Various marine activities and their potential impacts on this fragile ecosystem were discussed. What was evident is that the continual and expanded sharing of information from a variety of sources will only help us to better understand and protect our oceanic seabeds. Multiple groups were presented with goals related to adaptation, ecosystem conservation, and sustainable management. The presentation time slot ran over due to the lively and engaging Q&A that followed – well done Kristina. Antonio Paulo Badagola (EGS Survey) provided a technical presentation on how to determine the installation and burial details of submarine cables on beaches, which can be complicated due to a myriad of factors such as wave action, shoreline grades, and sediment makeup. This means that each shoreline has a unique personality. Methods of determining the depth and extension of new cables, as well as existing cables suffering from exposure, were covered – a critical topic given that burial is the primary form of protection employed today. ¡Viva las Americas! – this panel discussed recent issues, developments, and challenges related to how the Latin American region is developing its growing submarine cable network infrastructure. Given the number of cable upgrades and new cables planned for this region, there was indeed a lot to discuss. A panel on Cable Protection 101 illustrated, via a series of high quality videos from Alactel-Lucent Submarine Networks, NEC Corporation, and Global Marine Systems, how submarine cables are laid, raised, repaired, and lowered. 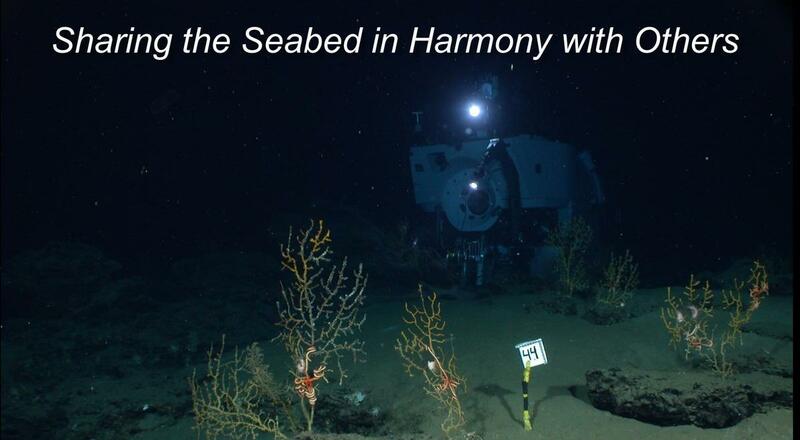 Laying and maintaining submarine cables on seabeds is an often-underappreciated science. The shown videos and discussion highlighted the ingenuity of the craft. 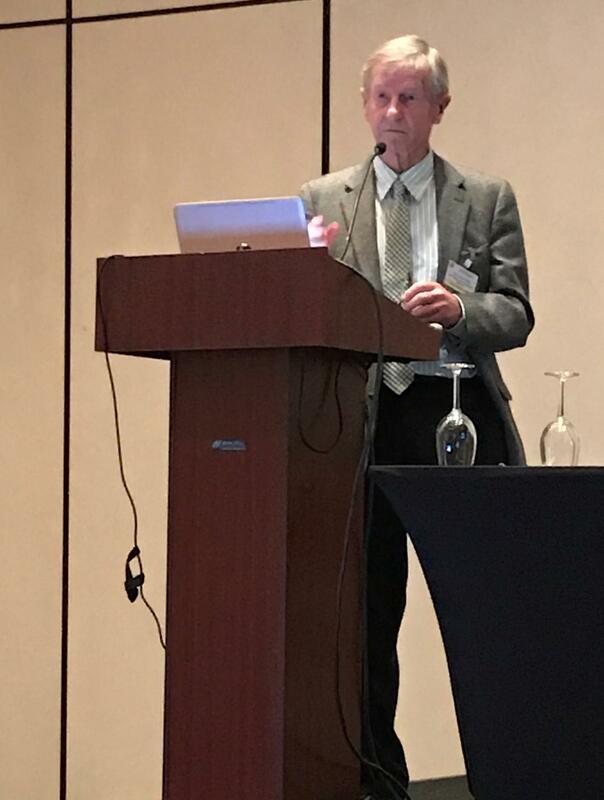 Dr. Bruce Howe (University of Hawaii) presented the values of sensors on submarine cables whose data can be used for a wide variety of purposes such as monitoring global change, tsunamis, and earthquakes, all of which are hot topics of interest today. The presentation was followed up by a Science and Submarine Cables panel discussing (and debating) the technological, security, political, and socioeconomic pros and cons of adding scientific sensors to commercial submarine cables, which is far more complicated than many perceive. Kent Bressie (Harris, Wiltshire, & Grannis LLC) highlighted possible issues related to extensive new extraterritorial marine protected areas covering regions that could affect trans-Atlantic and trans-Pacific cables. The controversies and intricacies of the US Antiquities Act were also raised. Due to the complexities and potential implications of the acts discussed, a lively Q&A period was inevitable. Lionel Carter (Victoria University of Wellington) challenged the assumption that seabed disturbance from cable burial is temporary and limited in space and time. A key challenge is the variability of continental margins, such as sediment supply/distribution/deposition, past/present geology, waves/currents, climate, biology, and of course, burial machinery. Several examples from around the world were presented to better understand the situation. Bottom line? Every case has a unique personality so accurate generalisations is just not possible. A quick shout out to the Plenary exhibitors Antel, Mertech Marine, and SeaGard is in order, who’re onsite to talk about their innovative technologies, products, and services, as it pertains to submarine cable protection. Come back to read about the final day of the 50th ICPC plenary where key announcements will be unveiled. First, the ICPC membership would like to sincerely thank Mertech Marine for an excellent opening reception where ICPC members could meet and greet each other in preparation for the first day on the 50th plenary. Graham Evans, ICPC Chairman, kicked off the first day of the plenary by highlighting that as of this month, the ICPC has grown to 165 members across various disciplines, all of which have a common mission – the protection of the world’s critical submarine cable infrastructure. Membership now includes cable owners, cable manufacturers, cable ship operators, route surveyors, cable system suppliers, governments, science institutions, and many associates. With such a broad and experienced membership from around the globe, the ICPC is well-positioned as the “voice” for the protection of undersea telecom and power cables. 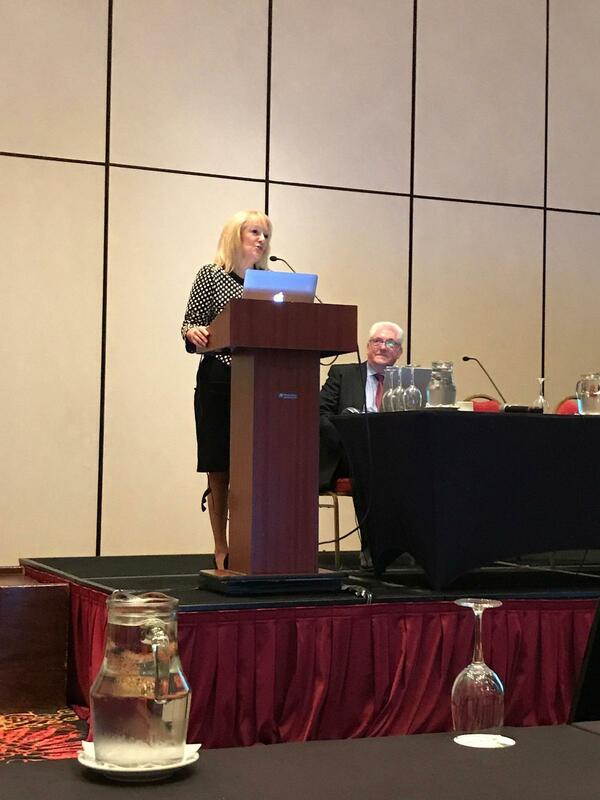 An informative presentation was given by Carolina Cosse, Uruguay Minister of Industry, Energy, and Mining, that provided an overview of Uruguay and its impressive standing in the world, particularly in South America. The fruit of the government’s labour is definitely paying off with Uruguay being named “country of the year” by the respected publication, The Economist, just a few years ago. Quite an impressive feat for a relatively small country of approximately 3.5 million inhabitants – ¡Felicitaciones! Always a plenary favourite, given its importance to the submarine network industry, Andy Palmer-Felgate (Edge Networks) presented the latest cable repair data. Progress was made in some geographic regions, not so much in others. This means there’s still room for improvement and an area where the ICPC can provide guidance. Gary Waterworth (Alcatel-Lucent Submarine Networks) presented the interesting yet formidable challenges associated with laying cables in the polar regions, now that these cold regions are being selected for new submarine cable builds. If you want to grab someone’s attention, give a presentation complete with videos of unexploded ordinance, say from World War II, being detonated. This is exactly what Tony Fisk (Pelagian Ltd) did in his unique presentation on how to handle unexploded ordinance in designated work areas, as well as mitigating risks when laying cables around such hazards. If you want to see an example of the videos presented, check out the link here . . . talk about on the job hazards! Lionel Carter (ICPC Marine Environmental Advisor) gave a solid presentation covering a wide variety of environmental topics related to the impact, or non-impact, of submarine power and telecom cables on the subsea environments. The latest investigations into whales entangled in submarine cables near Hawaii and Norway, were covered, which is important given these incidents were highly publicized. The investigation and mitigation plans are still ongoing. Lionel and Doug Burnett (ICPC International Cable Law Advisor) each discussed the United Nations Preparatory Commission (PREPCOM) Biodiversity Beyond National Jurisdiction (BBNJ) initiative and possible reopening of United Nations Convention on the Law of the Sea (UNCLOS), which could impact submarine cables. Doug explained the ICPC has adopted a strategy to ensure the freedom to lay and maintain cables in UNCLOS not be undermined by the BBNJ initiative. For more information on the intricacies of this complex topic, contact the Secretariat at secretariat@iscpc.org. You can also download the ICPC “Submarine Cables and BBNJ” paper here [? ], which is an informative read. Doug also covered the Jones Act and how the upcoming proposed changes could affect the future of submarine cable laying ships, telecom and power, and provided the ICPC position to the Customs & Border Protection (CBP) branch of the US government. Please contact the Secretariat at secretariat@iscpc.org to learn more about this rather hot topic and ICPC will put you in touch with Doug. Jayne Stowell (Global Network Acquisition, Google) discussed her personal experience when she and Doug Burnett attended the United Nations conference entitled “A World of Blue: Preserving the Oceans, Safeguarding the Planet, Ensuring Human Well-Being in the Context of the 2030”, which was appreciated by all. This summarizes just some of the highlights of first day of an exciting and engaging plenary session, with a full agenda slated for tomorrow that’s sure to stimulate thought and discussion, which is what the ICPC is all about – the exchange of information that allows for the sharing of the seabed in harmony with others. Come back to read about day two’s summary of the 50th ICPC plenary in Montevideo, Uruguay. In 2018, the ICPC will celebrate its 60th anniversary of promoting the protection of submarine cable networks, both power and telecom, by providing an interactive forum for exchanging technical, legal, and environmental information about submarine cables. With more than 160 members from over 60 nations including cable operators, owners, vendors, service providers, and governments, the ICPC is the authority of protecting submarine cable networks around the world, which have become simply too big to fail because they’re what stitch the world’s continents together into the global Internet that we all depend upon – every single day. ICPC members are already arriving in Montevideo, Uruguay, to meet for the 50th annual plenary session this week with the theme of discussing unmissable insights and challenges related to submarine cable planning, installation, protection, and maintenance. This year’s exciting agenda includes briefing sessions, networking, presentations, exhibitors, roundtable discussions, and keynote interviews that are sure to be both interesting and highly informative, so we hope to see you here in beautiful Montevideo. Graham Evans, ICPC Chairman, “welcomes everyone attending this year’s 50th plenary session and encourages a highly engaging week of exchanging information, ideas, and solutions to ensure the ongoing protection of the world’s submarine cables”. If you cannot make this years’ event, remain informed by tuning into the daily plenary session blog updates enabling you to remotely benefit from the exciting environmental, technological, and political topics being discussed here, live in Montevideo. The ICPC membership would like to extend a special thanks to Telxius for graciously hosting this year’s plenary session.